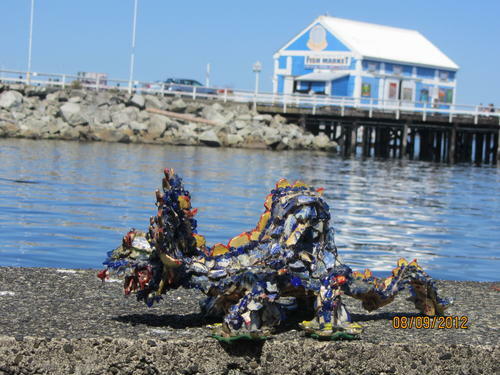 "Sid the Happy Sea Dragon" suggested a mascot for Sidney, made from beach shards found in 1998 by Geraldine Bruckel, at Sidney's Glassbeach. Thrown in the sea in the 1900s to 1940, by the residents of Olden Days in Sidney. Polished by wave action of the sea, makes this Sea Dragon happy as can be. 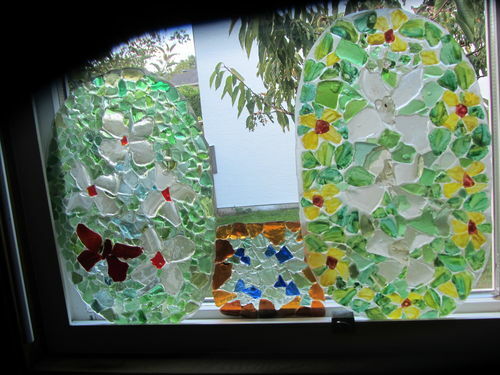 August 2013 - invented a new way of doing mosaic of beach glass. How to do it: find the glass at Sidney's beach, puzzle a subject you like to do on wax paper. When design is finished glue the pieces with super glue together. After, glaze it with Epoxy varnish. Today only most glass you can find are white, and brown. Colour the back of each white piece to make your own colour you want. Phone me if you are interested for more details and want to know how it is done, one lesson $10.- and you know how to do it. A Booklet about Sidney BC Early Days by Geraldine Bruckel. Olden days Sidney comes "alive again" with Geraldine's many black and white drawings. 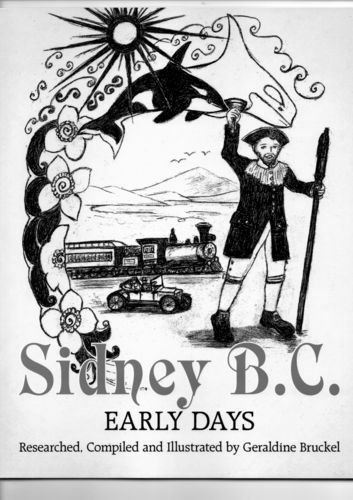 This souvenir booklet is an introduction of short easy to read stories of the history of Sidney BC, illustrated of the early days of Sidney, neighbouring communities and the Gulf Islands... The drawings are taken from old archive photographs by an artist with intense interest in her subject matter. The booklet is in chronological order. Researched and compiled events of Sidney Olden Days. This book is helpful for school children to learn about Sidney history, and also able to colour the black and white drawings. After reading the booklet you will want to visit the Sidney Museum.